Rose gold-tone stainless steel case with a black leather strap. Fixed rose gold-tone bezel. Black dial with rose gold-tone hands and index hour markers. Minute markers around the outer rim. Dial Type: Analog. Date display at the 3 o'clock position. ETA caliber F06.111 quartz movement. Scratch resistant sapphire crystal. Pull / push crown. Solid case back. Case size: 42 mm. Case thickness: 7.47 mm. Round case shape. Band width: 20 mm. Tang clasp. Water resistant at 30 meters / 100 feet. Functions: date, hour, minute, second. Additional Info: in general, withstands splashes or brief immersion in water, but not suitable for swimming or bathing. Dress watch style. Watch label: Swiss Made. 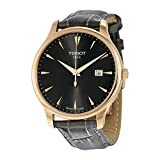 Tissot Tradition Black Dial Ladies Watch T063.610.36.086.00.